Nagpur: With the Second Capital City of Nagpur witnessing a flurry of cyber crime cases, a Cyber Police Station is set to start functioning in the city soon to deal with the crimes in hi-tech way. Many such cases remain pending for investigation and the new initiative will take care of this shortcoming. A Cyber Police Station has already been in place at Amravati. Apart from Amravati, Ahmednagar, Mumbai and Nashik too have Cyber Police Stations. As the Cyber Police Station could not be set up in Nagpur for reasons, the Cyber Police Cell was started. This Cell provides necessary help to local police in cases having cyber fraud of over Rs 50 lakh. The officers and personnel of Cyber Police Cell work under DCP level officer of Economic Offences Wing (EOW). It is pertinent to recall that the State planned to convert state-of-the-art cyber crime labs into cyber police stations, as part of the government’s strategy to take on cyber criminals. Maharashtra is the first state in the country which will have a cyber police station in each district. Cyber crime in State has risen in monstrous proportions in the last few years. For the normal local police stations, tackling cyber crimes is a daunting task owing to lack of proper training and technical knowledge. Cyber crimes are being reported in Nagpur city day out and day in. The proposed Cyber Police Station in city would come as a boon deal with the new age crimes in the cyber world. Two years ago, the Government had announced to set up 45 Cyber Police Stations across the State. Currently, the Cyber Police Cell has been functioning from fourth floor of Administrative Building No. 1 in Civil Lines. This Cell helps local police stations where cyber crimes are registered. 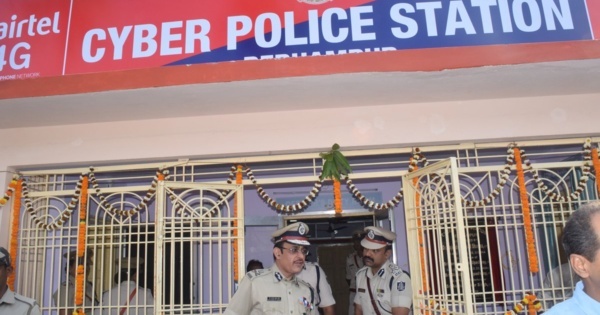 In Amravati, one Police Inspector, one Assistant Police Inspector, two Police Sub-Inspectors and 15 other police personnel handle Cyber Police Station. According to sources, top police bosses would be pondering over some vital facts for opening the Cyber Police Station in city. The facts include jurisdiction, which court should deal with the cases, requirement of police staff etc. As the Cyber Police Station could not be opened in the city, the then Commissioner of Police Dr K Venkatesham first set up Cyber Police Cell and then started providing specialised training to local police station staff from experts at N-COPS Centre. After opening of the Cyber Police Station, these trained personnel could be deployed there. The cyber police stations are equipped with trained manpower and modern equipment to deal with the new age crimes in the cyber world. Around 300 cyber crimes are registered in the Second Capital every year. Many crimes are not reported in different tale. Mentality of citizens plays a crucial role in this regard. But now the pichure is changing. Not only the citizens but the Guardian Minister Chandrashekhar Bawankule too is eagerly waiting to see Cyber Police Station functioning at the earliest. Bawankule at a programme recently announced setting up of Cyber Police Station in city. With this new initiative, any offence related to cyber crime will be registered at this Cyber Police Station. The Commissioner of Police Dr Bhushankumar Upadhyay has said that the Cyber Police Station in Nagpur is need of the hour. A proposal in this regard has already been sent to State Government. “The city police have cyber trained personnel who are currently working in Cyber Police Cell. These personnel would be deployed at Cyber Police Station once it is set up. If need be, more staff could be deployed,” the top cop said. According to sources, the Cyber Police Stations set up across the country are being handled by SP level officers. The cyber crimes include Trojan attacks, virus attacks, frauds, IPR violation, cyber terrorism, banking-credit card related crimes, e-commerce/investment frauds, cyber stacking, data thefts, source code thefts, computer source hacking, misuse of social media etc etc. Moreover, posting of obscene images through social media, secrecy violation and other computer related offences also come under purview of cyber crimes. E-mail related offences such as spaming, e-mail bombardment, threatening e-mails also considered as cyber crimes. The State Government had announced setting up of 45 Cyber Police Stations across the state. They were proposed to be set at Nagpur’s Koradi, Hingna and in Central part of the city also. The Cyber Police Stations were proposed to be set up in August 2017. But due to shortage of manpower, the plan could not materialise for Nagpur. Now, the Commissioner of Police Dr Bhushankumar Upadhyay initiating the necessary steps, hopes of Cyber Police Station in Nagpur are high. Currently, the Cyber Cell of city police is being handled by PI Bhanodas Pidurkar, PI Vijay Kare, APIs Vishal Mane, Rahul Shire along with three PSIs and 23 other police personnel. The coming up Cyber Police Station will have staff working in any other police station. According to amended Act of 2008, only the Police Inspector rank officer can investigate cyber crimes. Signature of this officer is must for arrest of the accused, submission of documents in court, seizure panchnamas, etc. Looking to the vastness of the work, at 8-10 Police Inspectors will have to be deployed at the Cyber Police Station.